Great staff, amazing with my daughter. – Emily S. and Ivy T.
The staff and doctors are always friendly and courteous, making you feel welcome. Thank you to the doctor and the rest of the team for your great service. I’m also extremely happy with my new prescription sunglasses. The doctor was professional, enthusiastic, and knowledgeable. She made the whole family feel comfortable. We liked that she made the connection of each family member and co-relating it all with our eyes. The rest of the staff was very friendly as well. Eye wear is reasonably priced. Great experience for all! The doctor was phenomenal as always-so knowledgeable, thorough and warm personality. The doctor was extremely helpful, knowledgeable and all around a very pleasant person. Thank you very much for amazing and fast service, you have left a great first impression. Staff was friendly and prompt. The doctor was as nice as ever and so personable. Very professional staff from the doctor right to the front desk staff. Always very helpful and honest when it comes to picking new frames. It was a great and positive experience for my children. 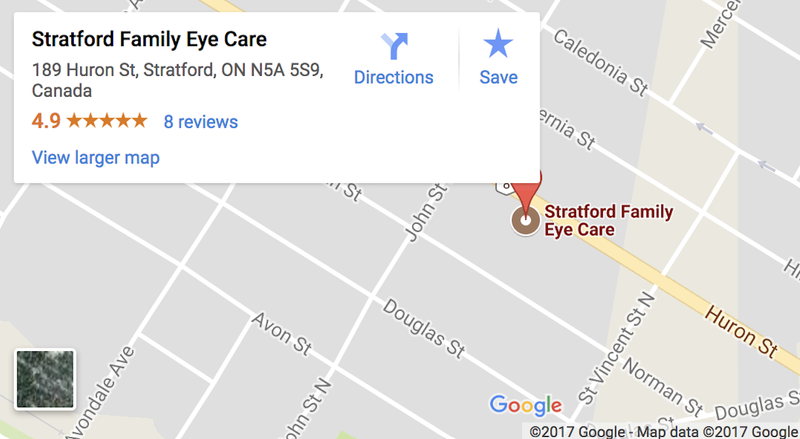 I have always been very satisfied with my experience at Stratford Family Eye Care. I don’t have a single complaint! I find that I look forward to my eye appointments as everything is explained so well to me. Great service and follow up. Always very friendly staff. Great knowledge with fit and styling of glasses. Keep up the great work.